Moviepass has disrupted the conventional cinema pricing strategy. Many theatres, especially in the USA, have been skeptical of a cinema subscription model ever since. However, cinemas should be proactive in evaluating their own pricing system to remain competitive. Especially due to digitalization and changing consumer behavior. 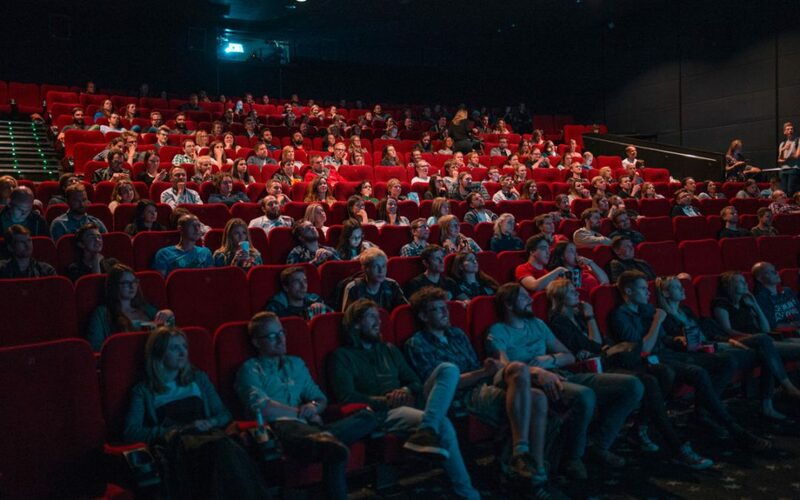 This article outlines the basics of cinema subscription models and gives advice on what exhibitors can learn from it. We are currently entering an economy phase. Many industries and companies focus on subscription-based business models. 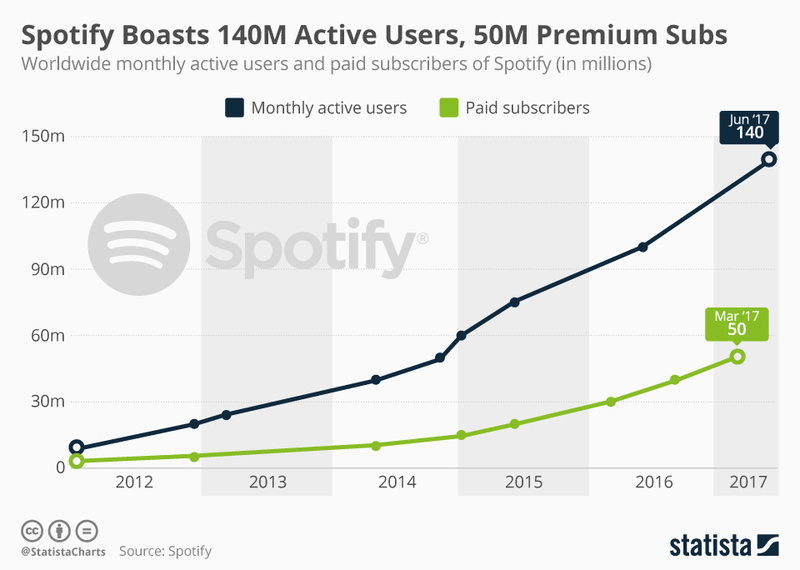 As an example, the subscription growth rate of Spotify shows a surge of users and subscribers from 2012 to 2017. The music streaming provider reached 50 million premium subscribers by June (Exhibit 1). Research on this topic shows that the younger generation is enjoying the benefits of using a subscription service. Particularly, without having to worry about unexpected costs and high charges. After all, according to a recent study by Deloitte, over 70 % of millennials (born 1980-1999) own a product subscription. Furthermore, almost 90% own a service subscription. Subscriptions are popular in industries, where customers purchase a ticket to receive a service. Examples are going to a concert, attending a sports event, or watching a movie in a cinema. Exhibit 2 shows the share of subscription tickets compared to total ticket sales. The sports industry reveals the highest subscription share, due to a loyal fan bases. The theatre and venue industry, as well as the ski industry, have an average subscription rate for tickets by 15% to 25%. However, cinema subscription share is only 5% to 15%, depending on region. 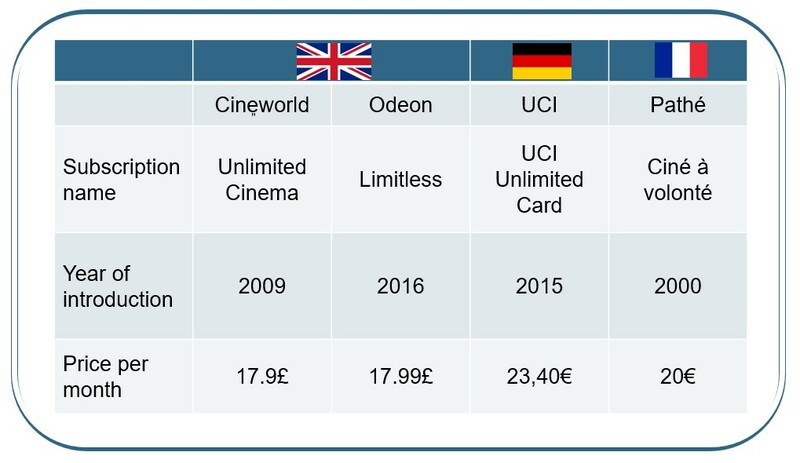 In Europe, Cinema subscription models have been successfully for quite some time. Exhibit 3 shows the subscription model of four major cinemas in the UK, Germany, and France. 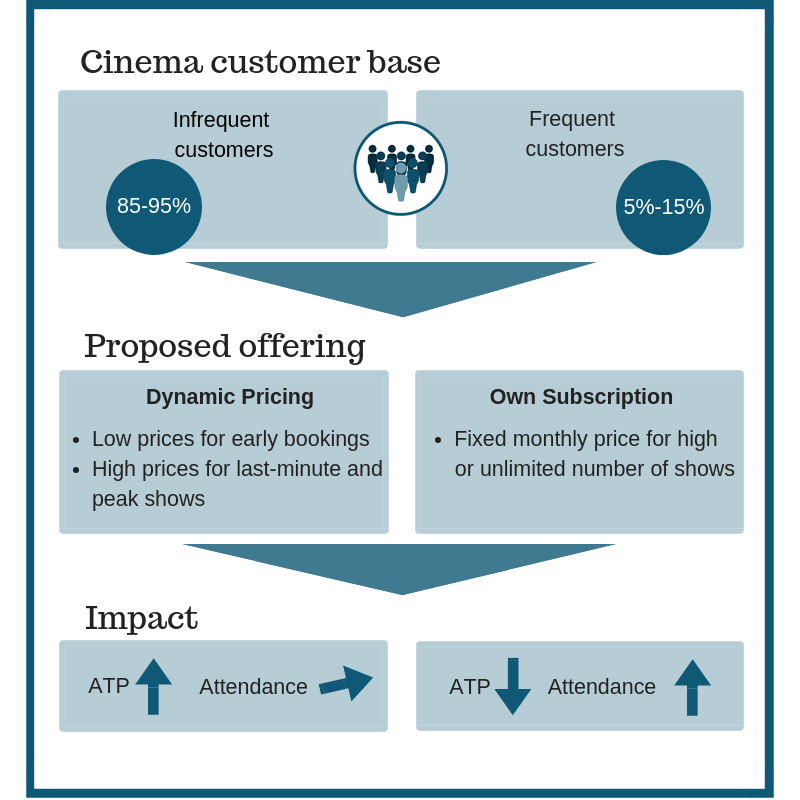 In the UK, cinemas use the concept of subscription pricing for a long time. The Unlimited Cinema card by Cineworld enables users to watch all movies they want for a monthly fee of at least 17.9£. Additionally, customers get discounts on food and drinks as well as benefits when referring a friend to the service. Cineworld is currently the leading cinema operator in the UK by box office market share with 99 cinemas and over 1017 screens. Odeon also has a subscription card, called Limitless. The card gives users the right to watch all movies they want for 17.99£ a month. Odeon followed the model of Cineworld and introduced the card 2 years ago. German UCI has introduced the UCI Unlimited Card in December 2015. It represents a subscription for at least 12 months for a monthly payment of 23,40€. Lastly, customers can see as many movies as they want in the theaters in France for 20€ a month. The answer is the UGC/MK2 illimité card. Another big French cinema chain, Pathé, offers its subscription card for the same monthly fee. All in all, visitors of the cinema chains in Exhibit 3 are adapting well to cinema subscription. It is the way to go for movie enthusiasts visiting a theatre at least two times a month. On the one hand, it brings people to movies, that they would not have watched without the model. On the other hand, this model enables rising concession revenue as well. However, subscriptions lower the average ticket price, especially for frequent filmgoers. The US cinema subscription provider Moviepass charges members 10US$ every month. As a result, they can watch a movie every day in a theatre of choice. 91% of American cinemas are available. Hence, the service is not bound to a certain cinema chain. The company pays theaters the full price for each ticket, by offering special debit cards to their members. It is worth noticing that the subscription cost of Moviepass is lower than theater run subscriptions. This is true in Europe or in newly introduced models like AMC in the USA. Hence, theaters are looking for a sustainable model, but Moviepass wants a major disruption. According to the company, the 10US$ monthly cinema subscription is aiming to activate people. It especially targets people, who resist rising prices. The subscription allows those people to visit the cinema more often. As a result. they watch all movies without worrying about the price. The model is accepted very well for the growing customer base. In June 2018, the company announced more than three million paying subscribers. Whether one likes the subscription model or not, the company has influenced the way US cinema operators think about ticket pricing. Firstly, America’s largest cinema chain AMC has introduced its own subscription-based model. Secondly, Regal Entertainment has announced to test demand-based pricing for tickets in the near future. Moviepass did it part to restore the casual nature of moviegoing. They encouraged viewers to check out releases they might have otherwise ignored. However, this comes at a high cost for exhibitors, who are losing control and data over visitors. The positive response of customers from cinema subscription services show, that the model is well accepted. It can fill theatres also for less popular movies. Additionally, America’s cinema giant AMC has recently launched its own subscription service for movies. The company offers movie visits up to 3 times per week. This includes multiple movies per day and repeat visits to already seen movies. All at 19.95US$ per month. Smart Pricer is working with top cinema chains. 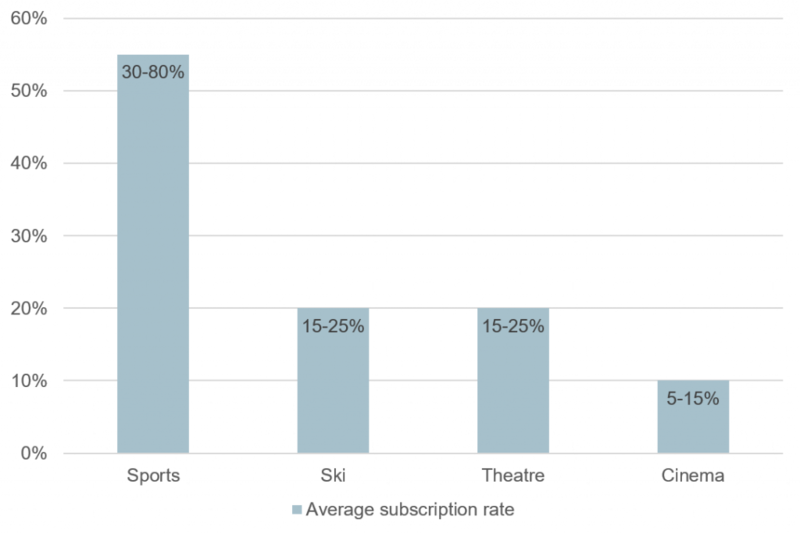 Our experience show that average ticket price (ATP) suffers as a result of cinema subscription. Because visitors are spending less money for more movies. Hence, the remaining 85% to 95% of regular priced tickets should be optimized. This offsets the ATP loss from subscription admissions. Dynamic pricing is a common way to do this. Flexible tickets attract infrequent and date-night movie-goers that reflects their preferences and price sensitivity (Exhibit 4). The ticket price is depending on many different factors under dynamic pricing. Examples are attendance forecast, movie life cycle, purchase channel, and the time until the movie starts. In general, movies with a high demand can be priced higher than average movies at off-peak times. The tickets can be even lower when booking in advance and online. Tickets at the box office right before the movie starts have an increased price. The average price of movie tickets is normally higher through dynamic pricing. Hence, dynamic pricing is the ideal tool to balance a subscription model. The average ticket price will remain while the benefits enhance customer experience. Moviepass decided to add an additional fee to “high-demand” movies. As a result, the public reaction was fierce. People were posting pictures of nearly empty theatres where they paid the extra fee. The reason for the price increase was not understandable. It is very important to communicate transparently a new pricing system. Explain the benefits and avoid surprised customers with unexpected rising prices. Customer communication is the key to success. The best way to master customer acceptance is showing the price structure clearly on all points of sale. Every visitor can choose the best fitting offer for their needs. This includes the website, the box office, and other sales channels. Smart Pricer’s team of pricing experts provides cinemas around the globe with necessary tools to increase ticketing revenues. We have over 10 years of airline pricing experience and done millions of price optimizations. Smart Pricer is the go-to-partner for companies such as Europe’s largest cinema chain Odeon-UCI. We continues to help companies achieve an increase in ticketing revenues by +5-15%. Click here to check our solutions in cinema pricing.